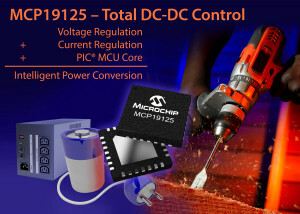 Microchip announces the availability of a new Digitally Enhanced Power Analogue (DEPA) controller designed to regulate current, regulate voltage, and monitor temperature. The device improves digital support for battery charging and is ideal for DC-DC conversion in server, consumer, industrial and automotive applications. The MCP19124/5 handles configurable charging algorithms for any chemistry, with capabilities for cell balancing and super-capacitor charging. No other single-chip battery-charging solution can be configured with any desired charging profile, for any battery chemistry, voltage, or cell arrangement. Users may develop their own unique charging methods and implement them as well. Any voltage, current, temperature, or duration can be used to trigger a transition to a new portion of the charge profile. These devices are also well suited for any DC-DC application requiring tight voltage or current regulation; capable of supporting flyback, boost, SEPIC, or Cuk topologies. A unique combination of independent voltage and current control loops. Either the current control loop can regulate to a specified target current, or the voltage control loop can regulate to a target voltage. Each analogue control loop has a separate feedback network for independent pole-zero placement, and the ability to perform zero-cross detection for quasi-resonant operation. The ability to dynamically switch from a voltage target to a current target, or vice-versa, by switching between the two control loops. The internal architecture ensures this transition is monotonic, without glitching or transient events. This control configuration even allows for pre-positioning of the output voltage at open or no-load conditions, greatly minimising transients when a load is applied. Integrated linear regulator, MOSFET drivers, 8-bit PIC® microcontroller core, analogue-to-digital converter, precision oscillator, and analogue control loops for a compact solution.